The Office for Catechesis is devoted to helping children of our parish become fully initiated into the community of Catholic faith. We organize the religious formation for the children in our parish attending public school in grades pre-school through eighth grade. It is also our pleasure to direct and organize the sacraments of Reconciliation, First Communion, and Confirmation for both the Catechesis Program and St. Paul of the Cross School All of our programs are approved by the diocese and are aimed towards leading the children to fulfillment in God through Christ and Church. We have many choices and ways of accomplishing the initiation of our children into the Catholic faith. This method of Catechesis utilizes a hands-on approach with special materials and lessons focusing on Scripture, liturgy, and the liturgical year. It is a prayerful, fun approach honoring the work choices of the child. Children are in atriums (classes) with multiple grades, called Levels. Parents who want to home school their children, along with partial instruction, will be given a syllabus at the first session, with homework to be completed by specific dates. 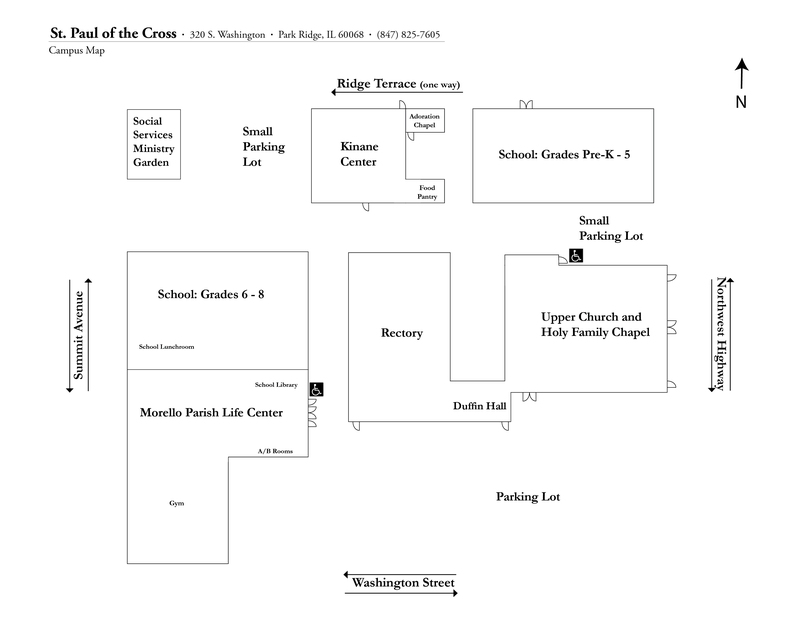 The parent and child/children meet with a facilitator and/or a speaker in Holy Family Chapel. This is an intergenerational program for the whole family. Parents and children, age four and up, discuss various religious topics and do various activities in large and small groups with the help of a facilitator. This program is centered on the Liturgical Celebration and follows the seasons of the liturgical year. It guides the students to an understanding of the basics of our Catholic faith and inspires them to practice their faith in their daily lives. Parent(s) and students attend the 4:30 p.m. Holy Family Chapel Mass on Saturdays and then stay afterwards for a lesson with the priest. These classes take place in a classroom setting where we invite children to get to know Jesus personally, to see Him as a source of comfort in the challenges of their daily lives, learn about their Catholic faith so that they may love and live their faith, and to connect with other children in their faith community. The Sacraments of Reconciliation, Communion, and Confirmation for grade school students in both Catechesis and SPC School are organized and run through the Office for Catechesis. Each year retreats are held for students preparing to receive First Communion and Confirmation. Our sixth, seventh and eighth-grade students participate in service each year in four different categories: St. Paul Service, Greater Community Service, Family/Friends, and School/Sports Service. Our students help out in our Catechesis classes, make shoeboxes for shut-ins at Christmas, collect money for the Baby Bottle Project, as well as many other service projects. Some of their good works have included the Centennial Garden, Holiday Outreach, the Fall Gala, and liturgical ministries.